This research report is an outcome of the contribution of the Austrian Academy of Sciences’ team within the EU-funded project GEITONIES. 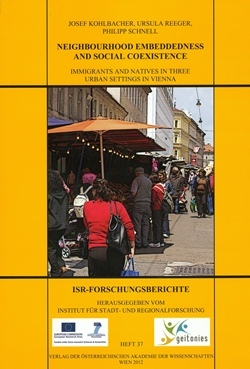 It is thematically focused on the connections between social contacts and neighbourhood embeddedness in three Viennese neighbourhoods. Comparing a typical bourgeois inner district (Laudongasse), a communal housing area (Am Schöpfwerk) and a neighbourhood in a working-class district (Ludo-Hartmann-Platz) with a Founder’s Period housing stock led the authors to interesting findings. The research was innovative by focusing not only on the immigrant population but on the whole population. A general result was that the differences between the three research areas are often much more accentuated than the differences between immigrants and natives who inhabit the same neighbourhood. This can be evaluated as an indicator of a specific “local atmosphere”, which shapes neighbourhood embeddedness. As a conclusion one can say that neighbourhoods are still important places for local residents and that social networks within the neighbourhood are the major explanatory determinant for differences in the levels of embeddedness. Thus, creating opportunities for meeting in public space may be a successful strategy on the way to a more cohesive urban society.